Thank you for purchasing Story theme. If you have any questions that are beyond the scope of this help file, please refer to the Support section. Thanks so much! 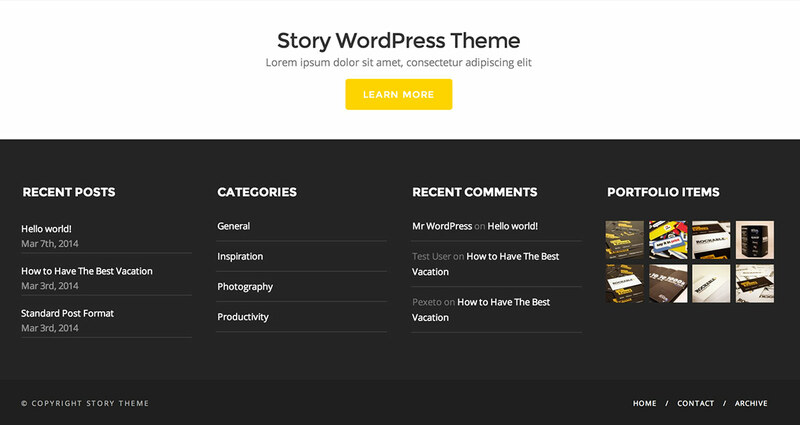 This theme requires the Classic Editor plugin. Please make sure to install the plugin before you start creating content with the theme. You can either install the plugin manually (from the Plugins -> Add New section) or follow the theme's notifications in the admin panel that will prompt you to install the plugin. Although building a website with WordPress is significantly much easier than coding it by yourself, if you are a beginner, even working with WordPress may be difficult to you. That's why, in this section we will provide some useful links and also will explain how to get oriented in the documentation and what pattern to follow when building your website with our theme. Please note that this documentation covers all the main settings for the theme, but it doesn't cover instructions about working with WordPress, as this is a very extensive topic. If you are new to WordPress, we would recommend to first get familiar with the WordPress system, so you can have at least basic knowledge about how it works and then proceed with setting the theme. Create your basic menu - during the process of setting your theme, you will be changing your menu links all the time. However, it is good to start with having the main menu set. Learn how to set your menu in the Setting the menu section. 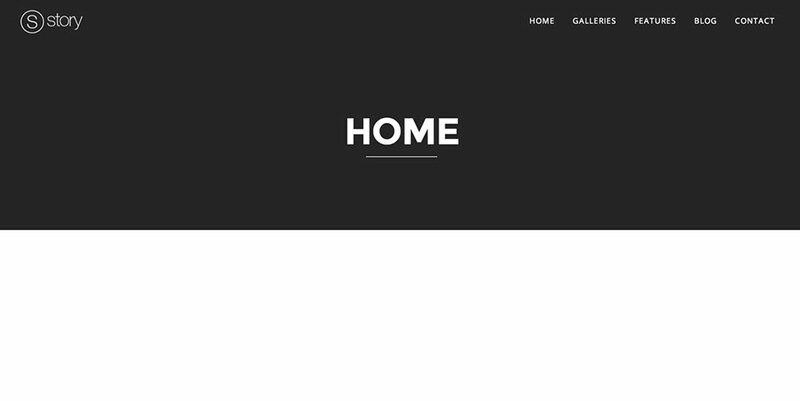 Go to Template pages » Home Page - Full-width custom page template section to learn how to create the page and how to add elements to it. You need a separate blog sidebar? » Go to the The sidebars section to learn how to create additional sidebars and how to add widgets to them. After you have created your sidebar, go back to the Blog page section to learn how to set the sidebar you have created to your blog page. Basically, these are the steps you have to follow - when you need to create a page, just go to its corresponding subsection of the Template pages section and read about how to create it and what settings you can do for the page. The main key about understanding how the theme works is to read the documentation we have provided carefully, as we have explained everything you need to know about the theme in here. Once you follow all these steps and have the basic theme setup, you can also check the rest of the sections of this documentation to read more about the other features that our theme provides. First you have to unzip the download file and find the zip file called thestory.zip. After this you have to go in the admin panel » Appearance » Themes, click on the Install Themes tab and then click on the "Upload" tab (located in the top section of the page). After you click the "Upload" tab, a new page will be opened where you will be asked to find the .zip file on your local file system. If you know the FTP login details of the server where your site is hosted and you have a FTP client installed (such as FileZilla), you might consider using this way of uploading your theme. First you have to unzip the download file, find the zip file called thestory.zip, unzip it and upload the folder to the main WordPress installation folder » wp-content » themes. Please note that if you prefer this way of installation, you have to make sure that the main files of the theme are contained just within one folder of the themes folder. The right way to locate your root theme files is for example themes/thestory but not themes/thestory/thestory. You can activate the theme after it is uploaded on the server. In order to activate this theme you have to go to the admin panel » Appearance » Themes. In this section you should see the theme with a title Story by Pexeto. Just click on the Activate button and your theme should get activated. If you would like to import the demo content, just go to Story » Demo Import section and select the demo data that you would like to import. Please install all the bundled plugins that you are going to use (such as WooCommerce, Recent Posts widget, Portfolio Items widget, etc.) in the Appearance » Install Plugins before importing the demo data so that all the data for these plugins can be imported. 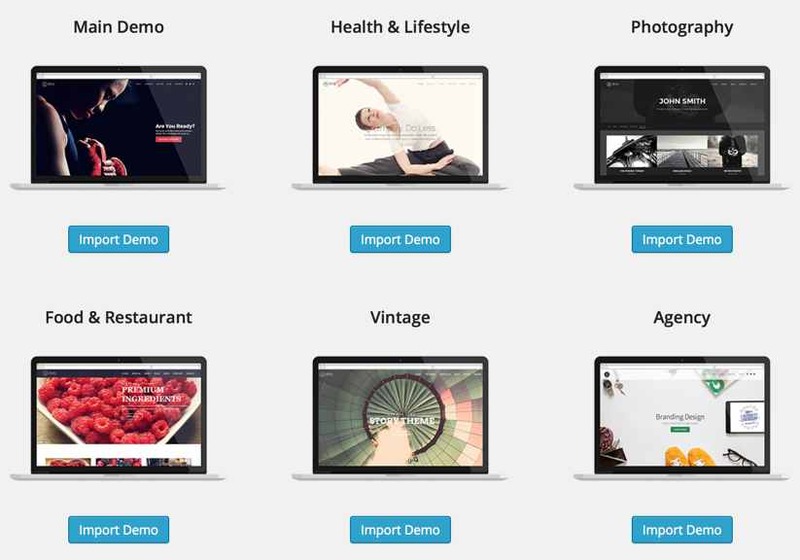 If you are planning to use WooCommerce, install the WooCommerce pages after importing the demo. When you activate this theme, an options page that contains global theme settings is created. This page is located in the admin panel » Story » Story Options. We have also added a custom settings section for the pages/posts where you can apply custom settings for each single page and post and these settings won't be applied globally to the theme. This settings section is located below the main content editor of the page/post opened it edit mode. For example, in the pages this section is called "STORY PAGE SETTINGS". To change the logo image, you can either use your own existing logo image or edit the included logo PSD file - it is called logo.psd and is located within the PSD folder. After you have your logo image, go to the Story Options » Header Settings » Logo section and select the logo image in the Logo Image section. If you would like to have a sharp logo image on retina displays, the image uploaded should be twice bigger than its display size - for example if the standard logo image size is 30x70 pixels, the image size of the uploaded image should be 60x140 pixels. The default logo image width is 100 pixels and the height depends on the original image ratio. If you would like to apply custom width or height to the logo image, you can do this in the "Custom logo image width" and "Custom logo image height" fields. When you fisrt install the theme, the menu will contain all the pages created and it sets drop-downs when there is a parent/child hierarchy created within the pages. However, we would recommend building your custom menu by using the WordPress Custom Menus functionality, as it is more flexible and very easy to work with. To learn how to create a WordPress Custom Menu, you can follow the instructions below. Then click on the "Manage Locations" tab section and select the menu that you have created in the "Story Theme Main Menu" field. If you don't see any menu items in this section, please make sure that you have assigned a custom menu in the Appearance » Menus » Theme Locations » Story Theme Main Menu (as explained above) and that you have added menu items to that custom menu. 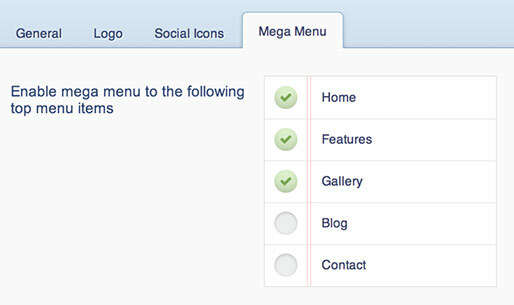 To set the icons, you have to go to Story Options » Header Settings » Social Icons » section. 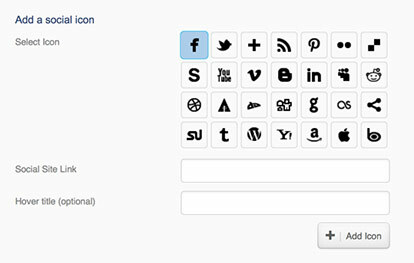 Note: Don't forget to click on the "Save Changes" button after you finish setting the Social Icons section. The header search field can be enabled/disabled in the Story Options » Header Settings » General » "Add Search in Header" field. The title in the header section is displayed by default on all the pages (created from the Pages » Add New section). By default the title contains the default page title, if you would like to set a custom title you can do this in the Title Options » Custom Page Title section and you can set the header subtitle in the Title Options » Page Subtitle field of the page settings section. Globally for all the pages you can select whether to show the pages title in the Story Options » Post & Page Settings » Pages » Display page title field. 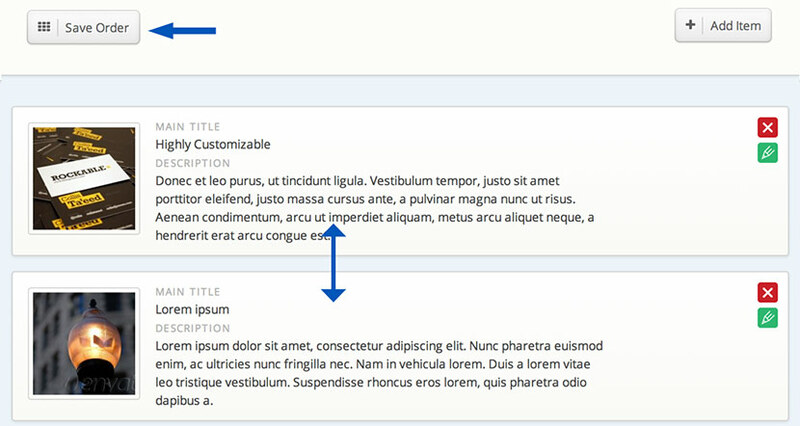 For each page in the Display Page Title custom field of the page. By default this field is set to apply the globally selected option, but you can also select the "Show" or "Hide" option for the page specifically. 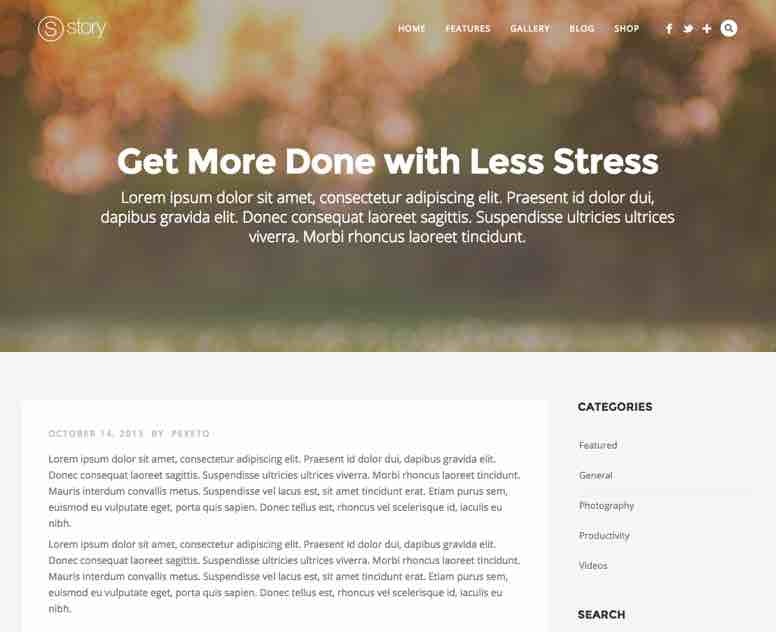 The theme includes a parallax effect option for the title section since version 1.3.0. When this option is enabled, the title opacity and default position changes and the background image in the header is set to a fixed position. You can enable/disable this option in the Story Options » Header Settings » General » "Enable header parallax effects" section. Globally for all the pages - the color you set in the Appearance » Customize » Header Color Settings » Header Background Color field will be set as a header color for all the pages. You can also set a background image for all the pages in the Story Options » Header Settings » General » Header background image field. You can also apply an overlay background to the header section to improve the readability and visibility of the menu links and the other elements, especially when using light images. You can enable this overlay background in the Story Options » Header Settings » General » Set a transparent overlay background to the top header field. The sticky header is enabled by default, you can enable/disable it in the Story Options » Header Settings » General » "Sticky Header" field. When enabled the header will be always displayed in the top section of the window, even after the user scrolls down the page. If you are using the theme in multiple languages you can enable the "Use texts for this section from translated PO file(s)" option and set these texts within the PO file included instead of the options panel. 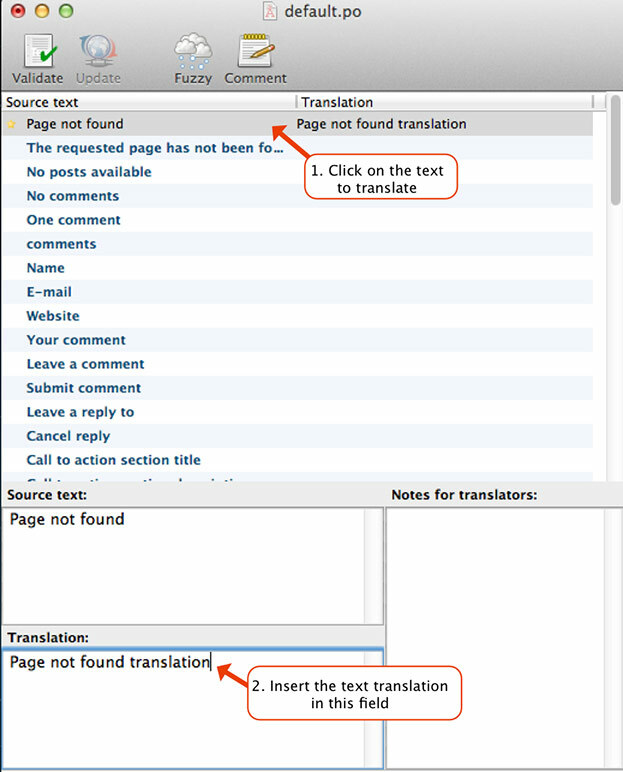 For more information about theme translation you can refer to the Translation section. 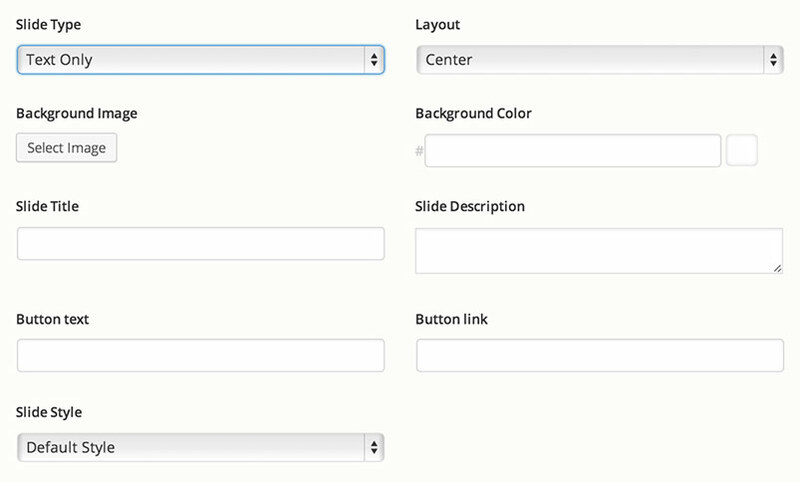 In the Story Options » Footer Settings » Footer Layout field you can select the layout for the widgetized area. You can either select the number of columns that this area will contain or you can disable the widgetized area by selecting the "No widgetized footer" option. If you select to display a widgetized area, you can then go to "Appearance" -> "Widgets" to add widgets to the footer. If, for example you have selected a "Three columns" layout, in the Widgets section you will see three widget areas called "Footer Column One", "Footer Column Two" and "Footer Column Three". After this you can drag and drop widgets from the left to any of these three boxes. The copyright text section by default displays your blog name. If you would like to set a custom text in this section, go to the Story Options » Footer Settings » "Copyright Section", then in the "Content" field select the "Custom Text" option and add your custom text to the "Custom Text" field. Go to Appearance » Menus and create a new menu. 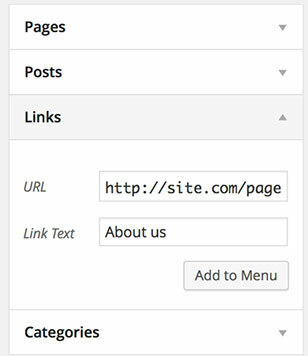 After you create the menu, you can add Page, Category and custom links from the left. To set the menu, click on the "Manage Locations" tab section and select the menu that you have created in the "Story Theme Footer Menu" field. 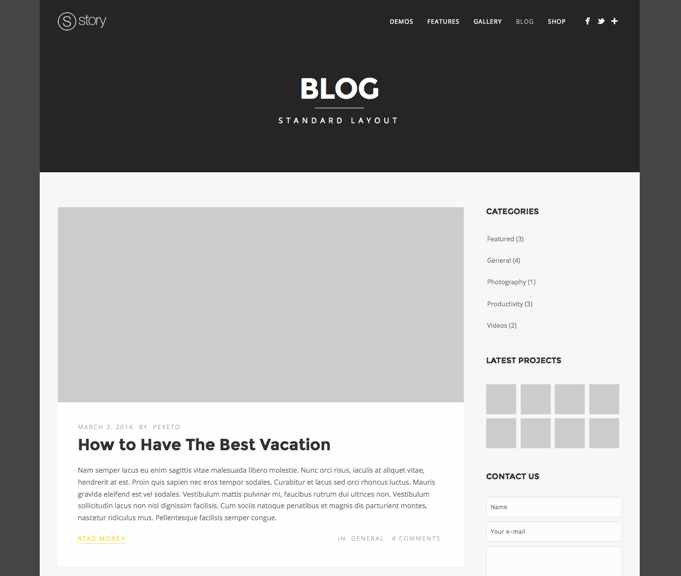 This theme supports multiple sidebars and they are all dynamic. This means that you can insert whatever widgets you like on them. 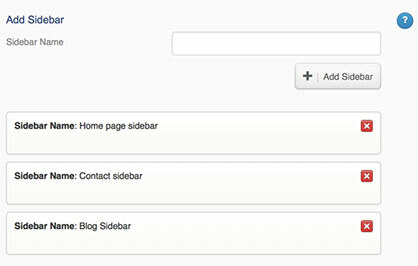 To customize your sidebars you have to go in the admin panel » Appearance » Widgets. In this section you will see your sidebars on the right part of the page. Now you can drag and drop widgets from the left into your sidebars. 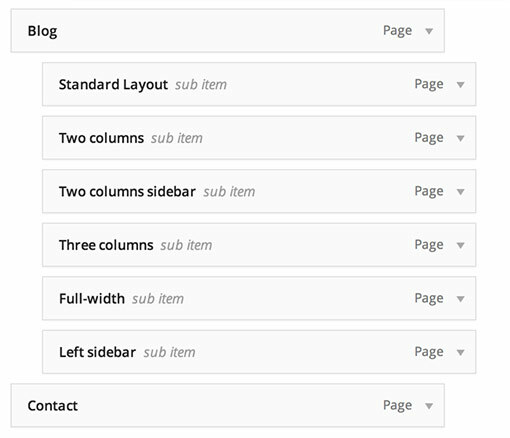 You can assign a custom sidebar to each page in the "Page sidebar" field of the Page Settings section. In the following video you can see how to create a fullscreen slider and add it to a page. We have also included more detailed instructions below. In order to add slides to this slider go to the Story » Fullscreen Slider section. For each slide there are different options that you can apply. This slide is designed to display a short text + description with a background image/solid background color. Optimal background image size: There is no specific default/optimal size for the background image - by default the background image is always centered in the visible slider area and how it is displayed depends on the user's browser window size and the default image ratio. It is recommended to use images that are around 1000 pixels and not bigger than 1500 pixels in size, so that the page loads faster. This slide is designed to display a longer text + description with an image and it optionally can have a background image/solid background color set. Default content image size: You can change the default image crop size in the Story Options » Slider Settings » Fullscreen slider » Image size options section. By default the images will be cropped to the predefined sizes, however you can disable the image cropping or modify the default crop sizes. If you would like to preserve the original image ratio when cropping just leave the height field empty. 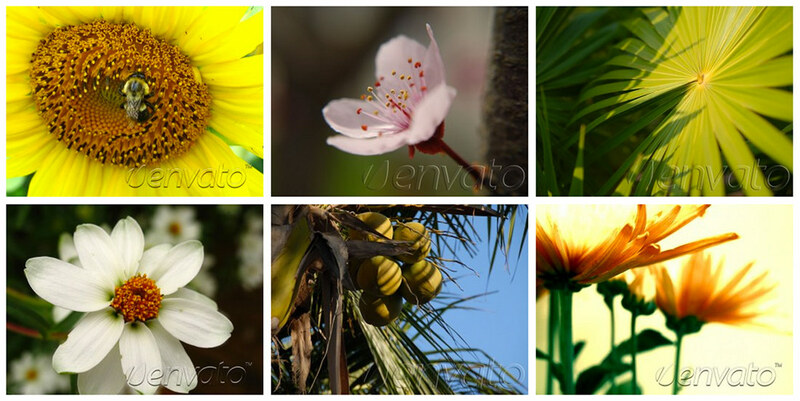 - Displays a horizontal image slider with multiple images. - Optimal image size: There is no specific default/optimal size for the background image - by default the background image is always centered in the visible slider area and how it is displayed depends on the user's browser window size and the default image ratio. It is recommended to use images that are around 1000 pixels and not bigger than 1500 pixels in size, so that the page loads faster. - Displays an HTML5 video as a background to the slide. - In order to make sure that the video will be supported by all the major browsers, you have to add the video in several different formats to the corresponding fields: MP4, WebM and Ogg. You can check the browser support for the different video formats in the "Video Formats and Browser Support" section here. It is recommended to add at least WebM and MP4 videos as all of the popular browsers support at least one of these formats. - Mobile Devices: - since mobile devices don't support autoplaying background videos you can instead choose an image to display on mobile devices in the "Mobile Devices Background Image" field. Please note that the purpose of the background video is just to enhance the appearance of the slder, however if you need to show an important informational video, you would have to choose another way to display this video. For example, you can link the slider button to a page that contains the video or you can embed the video into the Description section of the slide. For example, you can embed a YouTube/Vimeo video just by adding the URL of the video to the "Description" field of the slide and it will be automatically displayed. Create a new page from the Page » Add New section or open an existing page in edit more. Select the fullscreen slider that you would like to show (the "default" slider will be set by default) in the "Select fullscreen slider" field of the page. Enable autoplay: You can optionally enable autoplay in the "Slider Autoplay" field below (In the "Story Page Settings" section of the page). Since version 1.3.0 you can also enable autoplay to the inner horizontal slider in the "Slide Autoplay" » "Horizontal Slider Autoplay" field. Please note that the main "Enable Autoplay" option must be active in order the autoplay functionality to be applied to the horizontal slider. After you create a new slider you can select its name in the "Select fullscreen slider" field of the page. You can also apply different options such as image cropping, animation settings, etc. in the Story Options -> Slider Settings -> "Fullscreen Slider" section. and click on the "Add to menu" button. 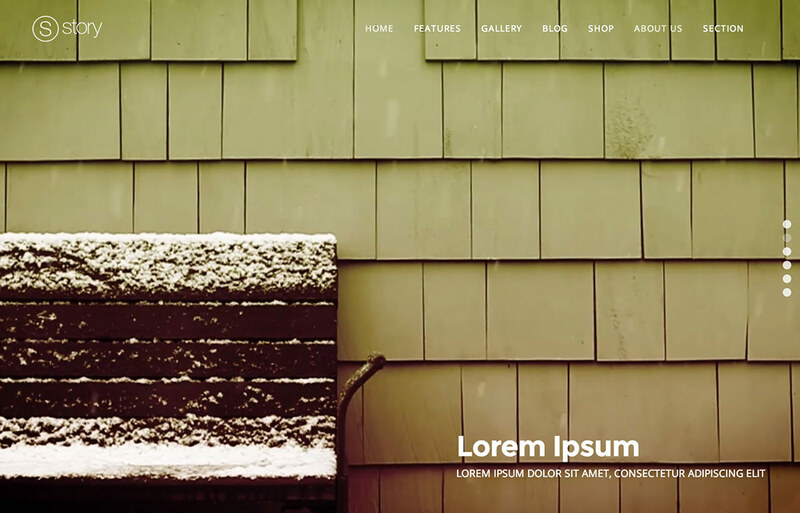 In the following video you can see how to create a content slider and add it to a page. We have also included more detailed instructions below. In order to add slides to this slider go to the Story » Content Slider section. For each slide there are different options that you can apply. 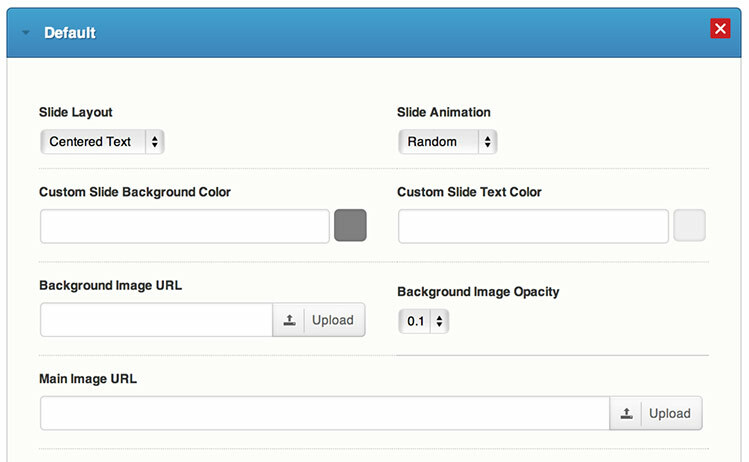 If you want, you can also set a background image to the slide in the Background Image URL field. You can also set the background image opacity in the Background Image Opacity field. You can set a main slide image when one the "Text on the left" or "Text on the right" layouts is selected for the slide - this image is displayed on the side of the text. You can set this image in the Main image URL field. In the rest of the fields below you can set some content to the slide, such as titles, description and custom buttons with links. 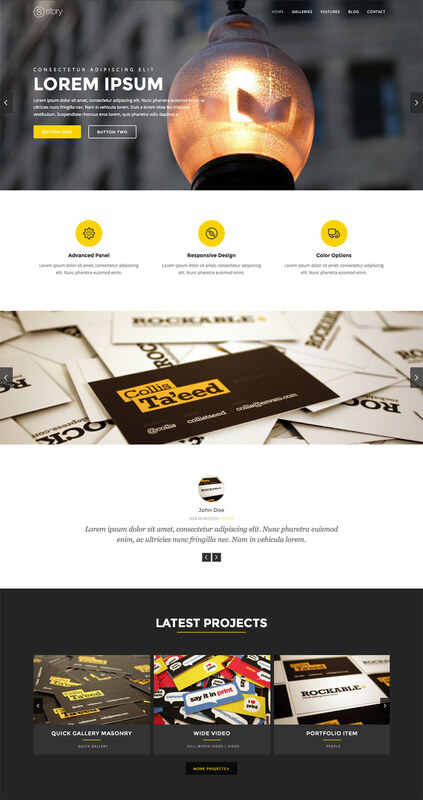 - Cover - covers the visible area of the slider with no parallax effect. - Contain - the image will be resized so that it fits within the slider area - it will be always fully visible with no hidden parts. When you set all the slide data, just click on the "Add Item" button to add the slide. If you would like to add a new slider with a different image set, you have to click on the "Add new Content slider" button located in the top section of the page and insert its name in the dialog box that will be displayed. After that a section for the additional slider images will be created so that you can set the new images to it. You can change the default slider options such as setting automatic image resizing and changing slider speed in the Story Options » Sliders » Content Slider section. - Main (side) image: 569px × 320px . The image height can be changed in the slider options section. - Background image: There is no specific default/optimal size for the background image - by default the background image is always centered in the visible slider area and how it is displayed depends on the user's browser window size and the default image ratio. It is recommended to use images that are around 1000 pixels and not bigger than 1500 pixels in size, so that the page loads faster. 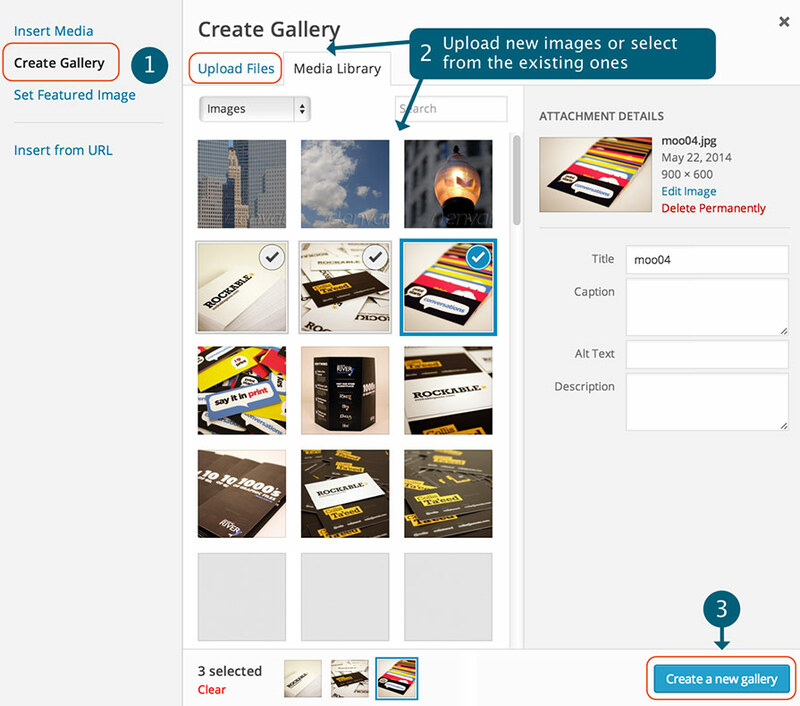 You can also apply different options such as image cropping, animation settings, etc. in the Story Options -> Slider Settings -> "Content Slider" section. In order to add images to this slider you have to go to the Story » Fade Slider section. All you have to do is to upload the selected image (or add its URL), fill the fields with the data you would like to display in the slider and press the "ADD" button. After that the image is automatically saved for the slider. If you would like to add a new slider with a different image set, you have to click on the "Add new Fade slider" button located in the top section of the page and insert its name in the dialog box that will be displayed. After that a section for the additional slider images will be created so that you can set the new images to it. You can change the default slider options such as setting automatic image resizing and changing slider speed in the Story Options » Sliders » Fade Slider section. Default crop image size: 1500px × 550px . The image height can be changed in the slider options section. Please note that although the images are set in static crop sizes, their display size depends on the browser window size, as the slider is always as wide as the window. If you would like to add a third party plugin slider to the header section of a page, you can do this by using the shortcode of the slider, if the plugin provides an option to add the slider via a shortcode. 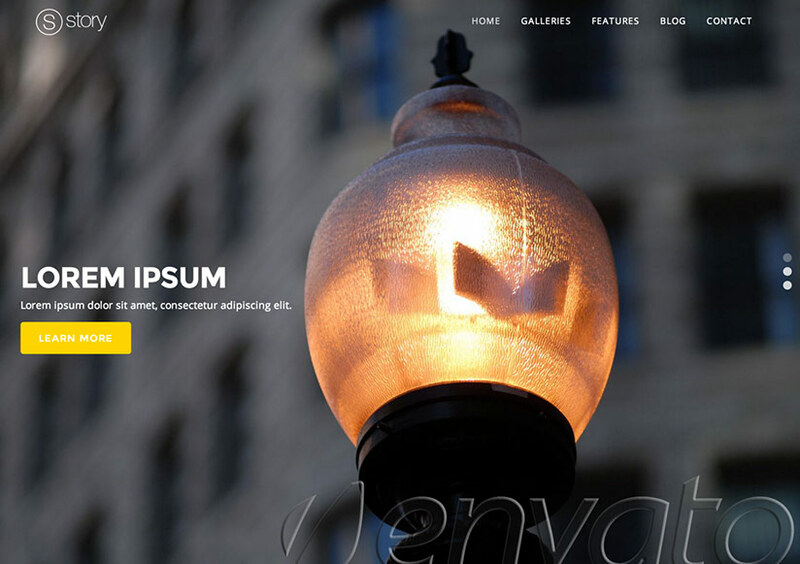 By default this page template uses the Default Sidebar. If you would like to use another sidebar, you can create one in the Story Options » General » Sidebars section and after that you can set the custom field Sidebar and select the sidebar that you have just created. To customize it you have to go to the Appearance » Widgets and find the selected sidebar. You can drag and drop widgets from the left into it. 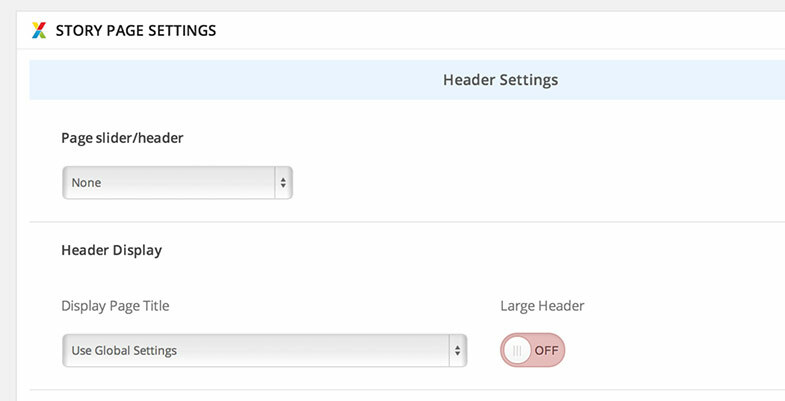 You can select the type of header on the page in the Page Slider/Header custom field of the page. In this field you can select between Fade slider, Content slider and None. 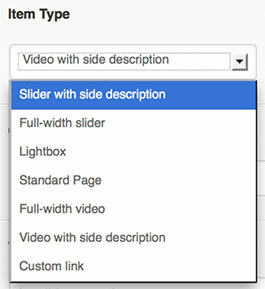 - If you select a slider, you can read about how to create and setup the slider in the Sliders section. You can read about how to apply a custom background color and background image to the page header in the Changing the default background color and image section. You can add many sections with different backgrounds and add different elements to all of them. In the "Template" field (located in the right sidebar of the edit page section) select "Full-width custom page" template. In the following video you can see how a background section is added to the full-width page. The video also shows how to edit the background section, change the colors and add a services boxes set to the background section element. You can check the full list of elements and how to add them in the Elements section. You can create the slides of the fullscreen slider in the Story » Fullscreen Slider section. You can read more about the slider options in the Fullscreen Slider section above. 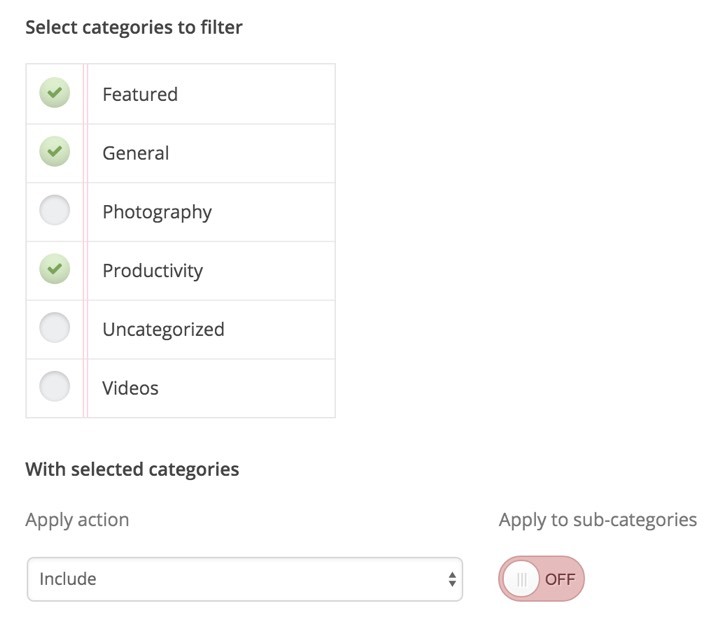 You can select which categories to include only or exclude in the "Select categories to filter" field. First, select the categories that you would like to include/exclude. After that, select whether you would like to include or exclude those categories in the "Apply action" field. If you select the "include" option, the blog page will show only the posts that are assigned to the selected categories. If you select the "exclude" option, the blog page will show all the posts, except the ones that are assigned to the selected categories. You can also select whether this action should be applied to sub-categories in the "Apply to sub-categories" field. When this option is enabled, if you have included or excluded a parent category, its subcategories will be also automatically included/excluded. In the "Number of posts per page" field of the blog page settings section you can set the number of posts to display on that page. 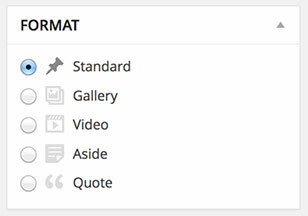 Since version 1.9.0 of Story, you can enable a category filter in the header of your blog page. The category filter can be enabled from the "Show category filter in header" section of the blog page settings. The category filter shows the categories based on the category filter settings of the page. When you have applied an "exclude" filter, the blog categories will include all the categories, except the ones that have been excluded. When the "include" filter is selected, the blog category filter will include only the selected categories to be included. If you would like to include the subcategories, just make sure that they are selected as well. In order to have advanced pagination enabled on your blog page (as on the screenshot above) you have to install the WP-Pagenavi plugin. You can read more about how to do it the section Plugins included. Then click on the "Create Gallery" section on the left, select the images that you would like to add and click on the "Create a new Gallery" button. After this just click on the "Insert Gallery" button to add the gallery to the post. The "Title & image in header" style would display the title and featured image of the post in the header of the post page. Although this style is primarily designed for the default post format, you can still use it with other post formats. For example, if you use set this style to a video post, the featured image would be displayed in the header of the post page and the video would be still displayed at the beginning of the post content section. When you select the "Title & image in header" option, you can also set a subtitle and apply a custom background color and image opacity in the "Header Subtitle" and "Header Background Options" sections respectively. You can enable/disable the related posts element in the Story Options » Post & Page Settings » Blog Posts » Related Posts Section. In this section you can also configure the settings for this element, such as selecting a category to display, the number of columns, etc. 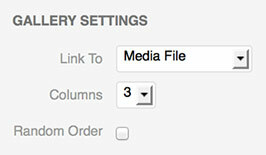 There is a blog posts option included in the Story Options » Post and Page settings » Blog Posts section. 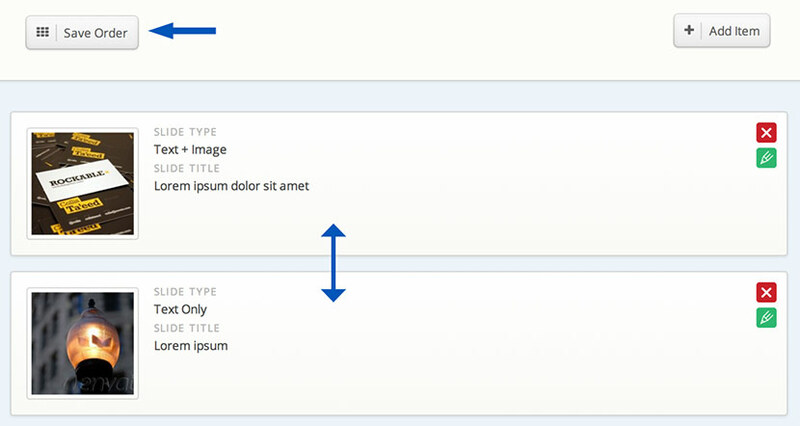 In this section you can set some options such as selecting the default single post layout, single post sidebar what info to display for the post (e.g. date, category, etc.). In this section are included the main steps you would have to follow in order to set this page, more options and settings are described in the "Other Gallery Page Options" section below. You can create a new item in "Portfolio" » Add New section. You can set the title in the "Title" field of the item. After this when you click on each image in the gallery, in its Caption field you can set a description to it. You can also change the default image order by dragging and dropping the images on different positions. When you finish editing the images Click on the "Insert Gallery" button. This will insert a gallery object into the content section of the portfolio item. 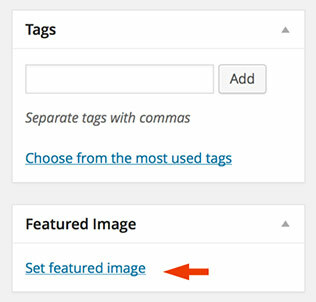 By default the first image of the images you have added will be used as the item's thumbnail. If you would like to set another image as thumbnail, you have to set it as featured image to the item. You can read about how to set a featured image here. As the images uploaded would be bigger, the thumbnail image will be resized automatically to the size in which it should be displayed. However, if you prefer to use your custom thumbnail image, you can set it in the "Custom Thumbnail URL" field of the item. You can read about how to add the images to the slider in the "Add images" section above. The slider description is the actual post content - the content that you insert in the portfolio post content editor area will be displayed as a description to the item. 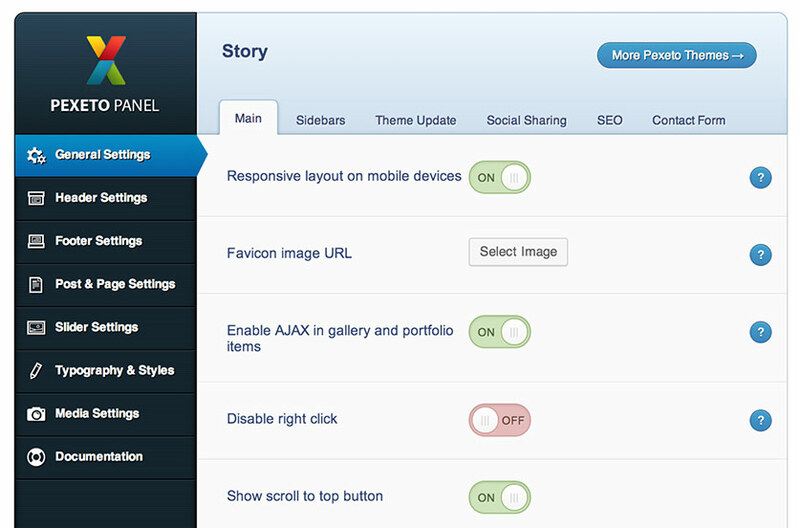 You can change the default slider options in the Story Options » Slider Settings » Portfolio Slider section. In this section you can select whether the images to be automatically resized or not and select whether to display a related projects carousel below the slider and you can also customize the default carousel options. 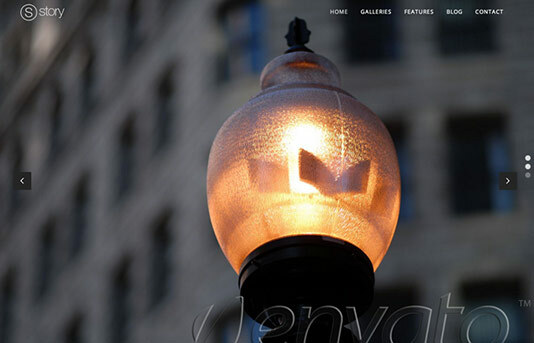 By default the lightbox items are designed to display albums of images - each items displays a set of images in the lightbox. However if you would like to have only one preview image per item and have all the lightbox images in the gallery page related in a group, so that when you click on the first item's image and then click on the "Next" arrow of the lightbox, the second item's image will be displayed, you can enable the "Make lightbox items preview images related to each other" option in the gallery page settings section. The item will be displayed in a standard page format. In the Story Options » Post and Page Settings » Portfolio Posts section you can select the layout and sidebar for the page. Displays a video either in a full-width layout or with a side description. You can set the video URL in the "Video URL" custom field of the portfolio item. 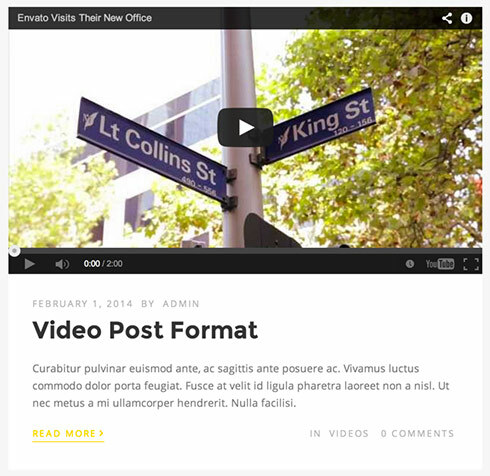 The theme uses the WordPress [embed] shortcode to insert the video, you can see the supported formats on the WordPress Embeds page. We have also included support for Flash videos (with .swf extension). The gallery page includes some customization options in its settings section which is located below the main content editor of the page. In the Filter portfolio categories section when the Filter Type option is set to "Exclude" the select categories will be excluded from the page. 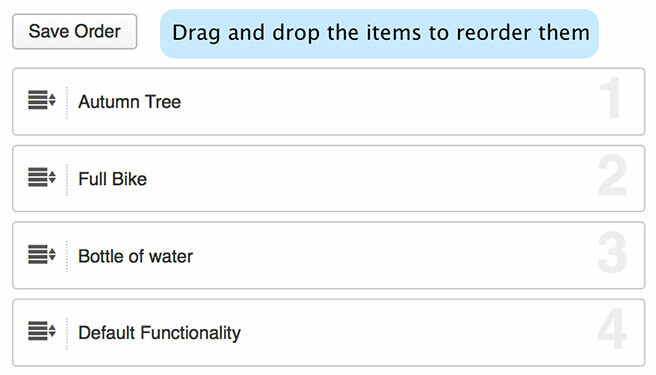 If the "Include" option is selected, only the items from the selected categories will be displayed. 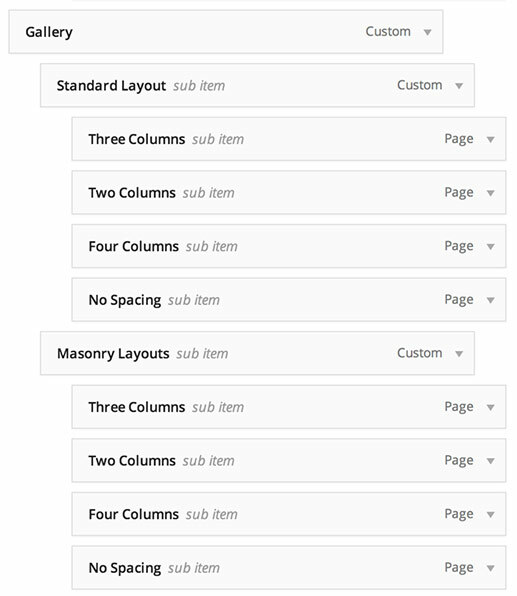 You can enable a Masonry layout in the "Masonry layout" field. If you enable this option, the images height will vary depending on the original image ratio and also the images will be positioned one below another by filling all the space. If the "Masonry layout" option is disabled, you can set the image height in the "Thumbnail image height" field. The theme includes some options to change the appearance of the thumbnails, such as hiding the title/category of the thumbnails or removing some of the hover effects in the Story Options » Post & Page Settings » Portfolio Posts » Portfolio Thumbnail Settings section. After this when you click on each image in the gallery, you can set a caption that will be displayed below the image thumbnail in the "Caption" field and also you can set a description that will be displayed in the lightbox preview in the "Description" field of the image. In the "Link to" select "Media File" and in the "Gallery Columns" field select the number of columns you would like to display. 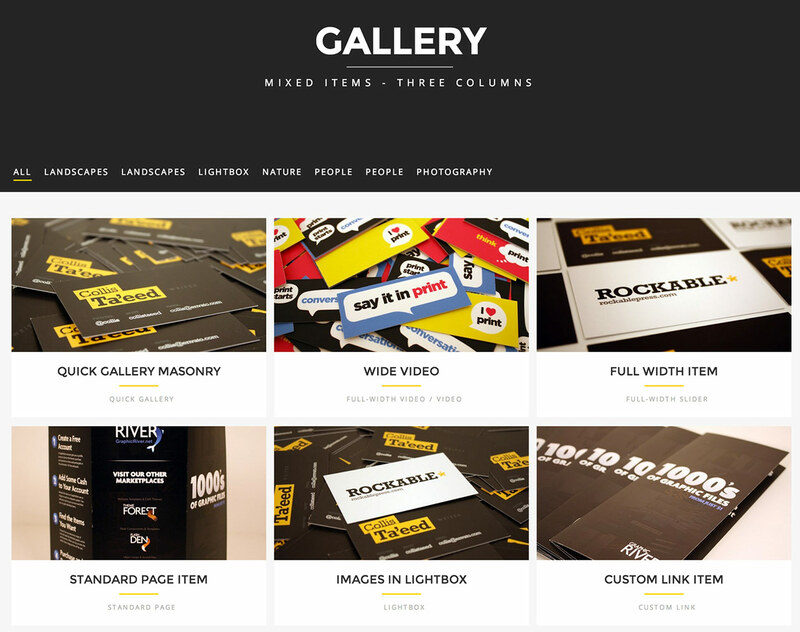 The full-width gallery option is available since version 1.3.0 of the theme. 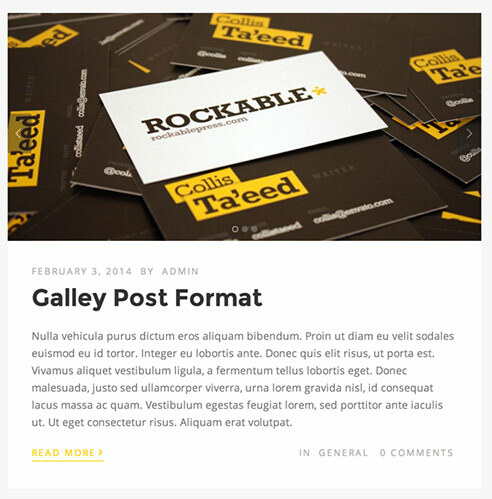 By default the quick gallery is displayed in a boxed layout when added to a Full-width custom page template. If you would like to set a full-width layout, you can do this in the "Full-width pages gallery layout" field of the Story Options » Media Settings » Quick Gallery. The quick gallery options section can be found in Story Options » Media Settings » Quick Gallery section. For the different post types (post / page / portfolio) you can enable/disable the masonry layout and if the masonry layout is disabled you can set a default static height to the thumbnail images. This page contains an AJAX contact form which visitors of your website can use to contact you. You can set the e-mail address to which to send the messages in the Story Options » General Settings » Contact Form » Email to which to send contact form message field. You can set the e-mail address to which to send the messages in the Story Options » General Settings » Contact Form » Email sender field. Version 1.9.6 of the Story theme introduces a data collection consent checkbox option in the contact forms. When enabled, a checkbox requesting consent for storing and using the visitor's personal data (that they submit with the contact form), will be added to the contact form. When the option is enabled, the checkbox will be required, which means that the visitor will need to check this box in order to send the message. For GDPR compliancy, you must also mention if you will send or share the data with any 3rd-parties and which. Important: In version 1.9.4 we have updated the reCAPTCHA widget to version 2, since the deprecation of version 1. The version 1 API will be shut down in March 2018, so if you are using capctha in your contact form, please make sure to update the theme to the latest version. If you have updated the theme from an eariler version, please make sure to follow the instructions above to generate and setup new API keys. 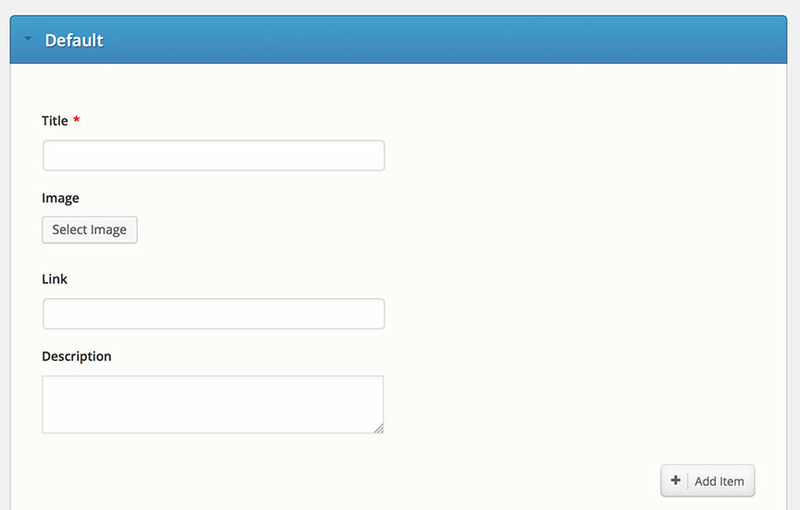 The built into the theme contact form by default supports the following fields: Name, E-mail address and Question. If you need to change these fields and add new fields, we would recommend using the Contact Form 7 plugin instead - you can download it for free from here. The theme includes built-in styles for this plugin so its elements style would match the theme's style. This plugin is very easy to install and use - you can very easily build custom forms with it. You can find the Contact Form 7 documentation here. 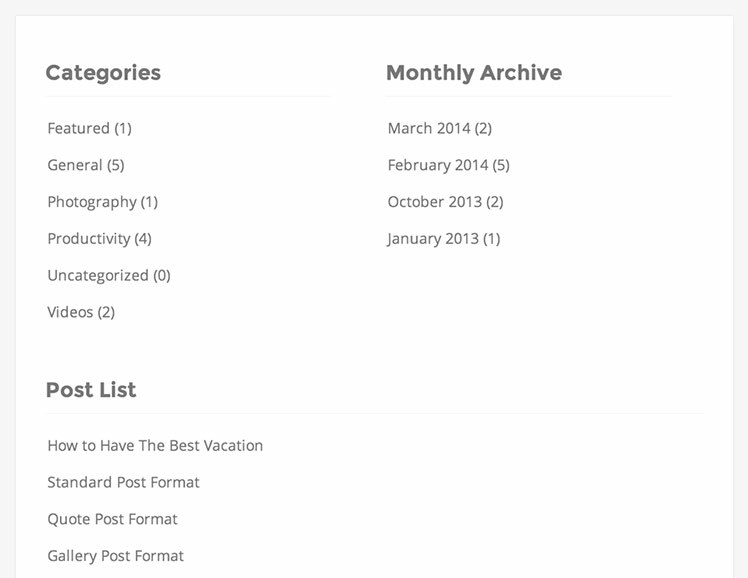 The archive page displays an archive of the blog posts by category, month and a list with the posts. Important: If you are running WordPress 5.0 or newer, please make sure to install the Classic Editor plugin. This theme supports the classic editor only and a major part of its elements rely on the classic editor. In the following video you can see how to create a services boxes set and add it to the page. We have also included more detailed instructions below. You can create the services boxes in the Story » Services Boxes section. You can create many different services box sets and include them in different sections of the pages and posts. To create a new Services boxes set just click on the "Add New Services Box Set" button in the top right section of the window. 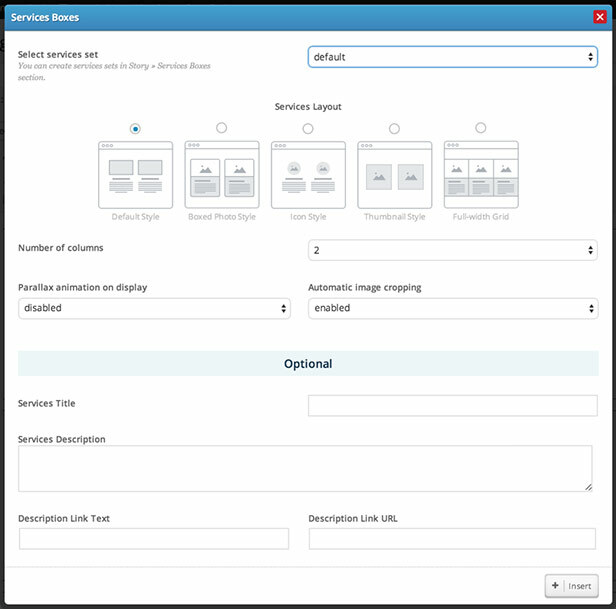 Parallax animation on display - if enabled, each of the services boxes will be animated with a parallax animation when the user scrolls to the services set. If you would like to add a link (for example a "Read more" link) in the Description section of the services set, you can setup the link data in the "Description Link URL" and "Description Link Text" fields of the dialog. The portfolio carousel displays a set of portfolio items. 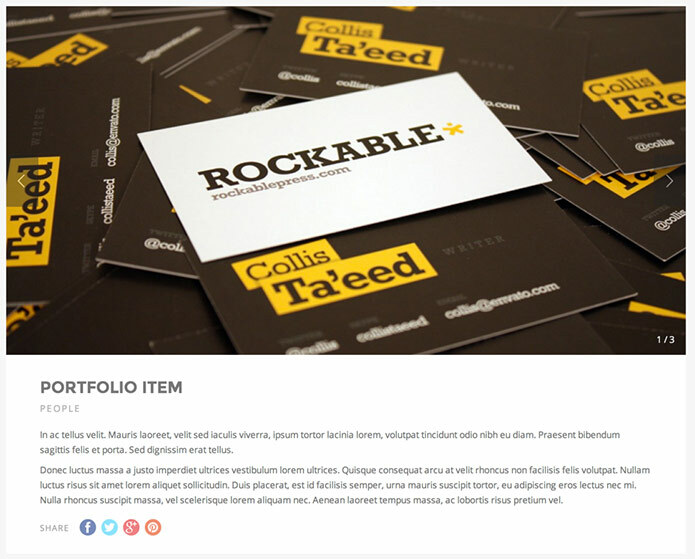 You can read about how to create portfolio items and all the options that you can set to them in the "Creating the portfolio/gallery items" section of the Portfolio Gallery template section. In the dialog that will be opened you can choose the portfolio category to display, set a title and setup the ordering options. 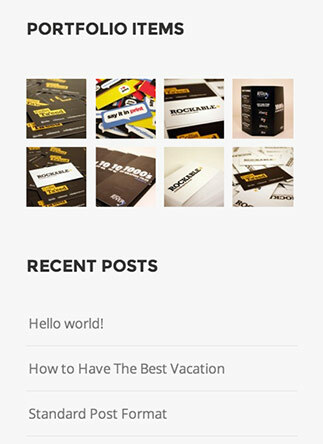 The carousel will be added as a shortcode in the content of the post/page. When the carousel is added by using the content editor "Portfolio Carousel" button, you can set a custom height to its thumbnails in the "Thumbnail Height" field of the element settings. For the portfolio items that automatically include the carousel element, you can set a custom height of the thumbnails in the Story Options » Sliders » Portfolio Slider » Related projects carousel » "Items thumbnail height" field. 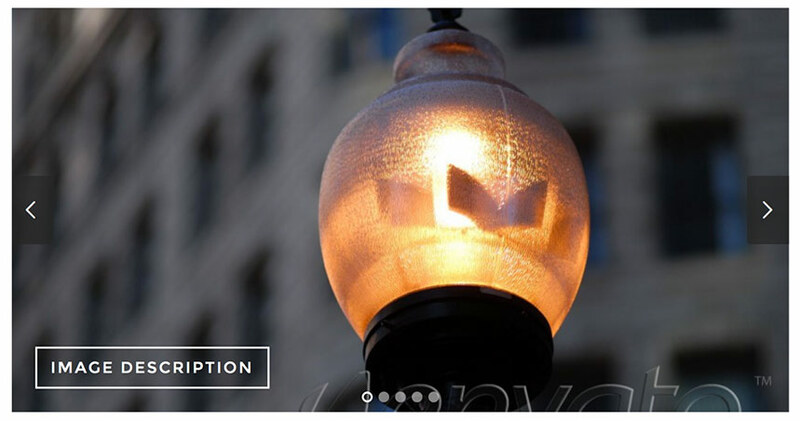 For lightbox items the carousel would by default show a single preview image per item. If however you have added a gallery of images to the content of the item and you would like to display all of the images in the lightbox preview, you can select the "Album Preview" option in the "Lightbox Preview Type" field of the carousel element. When inserting the Recent Blog Posts element, select your Featured category in the "Show posts from category" field. 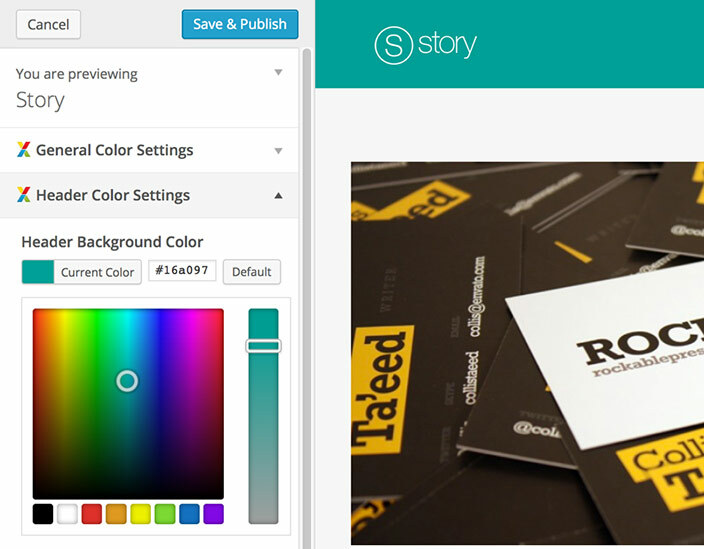 You can create the testimonials in the Story » Testimonials section. By default there is a "Default" testimonials set created where you can add the your testimonials. 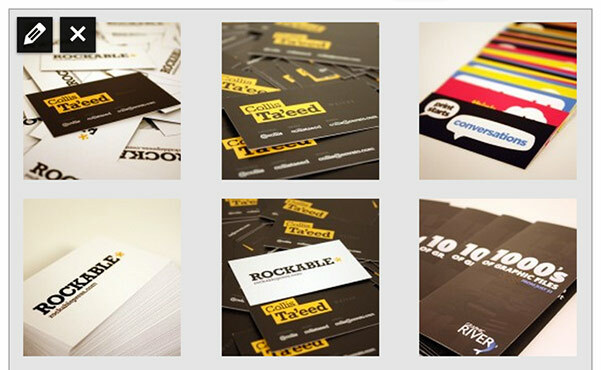 You can create many different testimonial sets and include them in different sections of the pages and posts. To create a new testimonials set just click on the "Add New Testimonials Set" button in the top right section of the window. In the "Select testimonials set" field you can select a specific set of testimonials to show on the testimonial slider. Please note that this circle is with a static size and it is designed to fit short titles only. If you insert a Content slider into the content of a Full-width custom page template, the slider will be displayed in a full-width size, for the rest of the pages and posts, the slider will be set to fit the width of the content container element of the page/post. You can create different sliders within the Story Options -> Content Slider section. 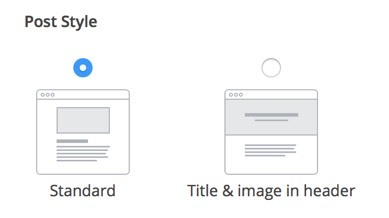 You can learn more about creating sliders in the Content Slider section. You can also customise the default slider settings in the Story Options -> Slider Settings -> "Content Slider" section. If you insert a Fade slider into the content of a Full-width custom page template, the slider will be displayed in a full-width size, for the rest of the pages and posts, the slider will be set to fit the width of the content container element of the page/post. 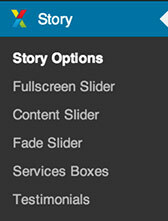 You can create different sliders within the Story Options -> Fade Slider section. You can learn more about creating sliders in the Fade Slider section. You can also apply different options such as image cropping, animation settings, etc. in the Story Options -> Slider Settings -> "Fade Slider" section. You can create pricing tables in the Story » Pricing Tables section. By default there is a "Default" Pricing Table set created where you can add your Pricing Table items. When adding a pricing table item you can make it highlighted by checking the "Highlight" option. You can create many different pricing tables and include them in different sections of the pages and posts. To create a new Pricing Table just click on the "Add New Pricing Table" button in the top right section of the window. In the "Select a pricing table" field you can select a specific Pricing Table to show. In the pricing table dialog you can also select the number of columns to set to the pricing tables and a custom highlight color. The theme includes sharing buttons for the main social network sites: Facebook, Twitter, Google+, Pinterest and LinkedIn . These buttons can be enabled on posts, pages, portfolio posts and portfolio post sliders. You can configure the how and where the buttons will be displayed in the Story Options » General Settings » Social Sharing section. 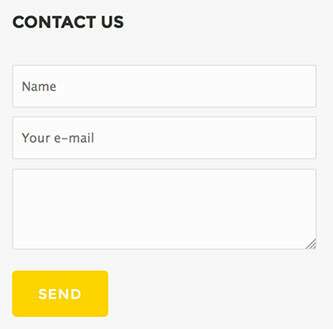 [contactform] You can set the email to which to send the messages in the Story Options » Page Settings » Contact section. You can change all the theme colors in the Appearance » Customize section. 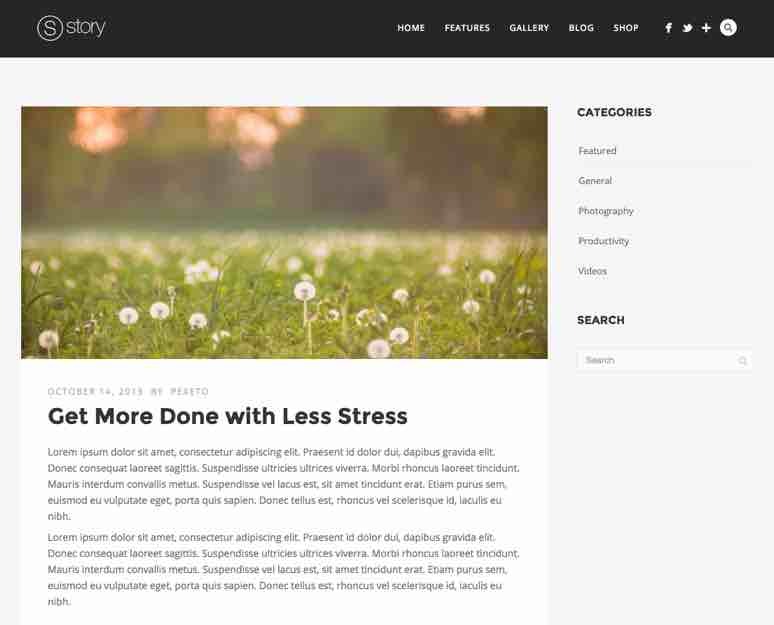 The rest of the Theme Customizer sections contain some general style settings, such as colors for the main header, content and footer areas. You can set the boxed layout to the theme in the Story Options » General Setting » Main » "Theme layout" field. If you would like to set a background image to the boxed layout, first make sure to refresh the options page after selecting the boxed layout option, then you will see a "Boxed layout background image" option just below the "Theme layout" field where you can select a background image and set its style. If you would like to make CSS modifications to the theme's style, you can insert the additional CSS changes into the the Story Options » Typography & Styles » Additional Styles. It is recommended not to edit the style.css file, as this file will be reset to default once you update the theme and you will loose your CSS modifications. 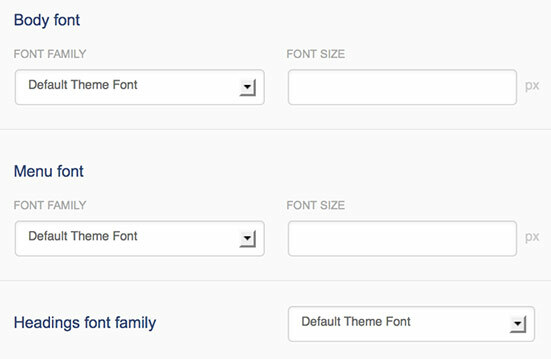 Another option to safely make CSS modifications is by creating a WordPress child theme. You can read more about creating child themes in the Installing a child theme section. By default the theme uses the "Open Sans" (for the body text) and "Montserrat" (for the headings) Google fonts. 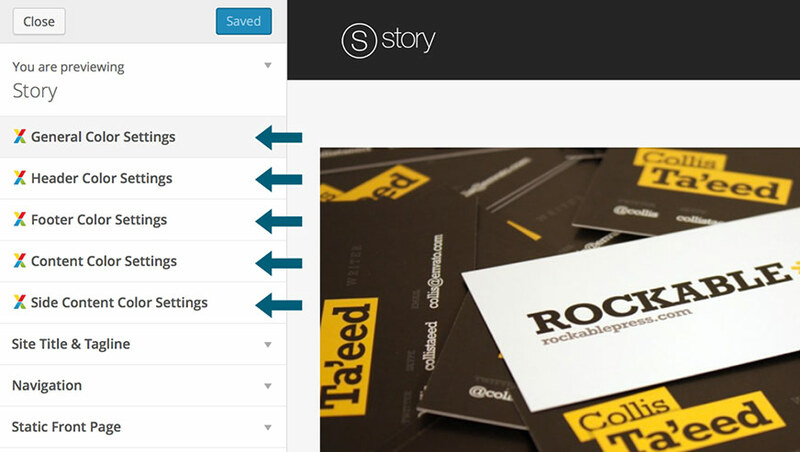 All the fonts settings can be applied in the Story Options » Typography & Styles » Fonts section. By default you can select between the standard web-safe fonts in the font options. However, you can also add custom Google fonts. In order to use Google Fonts, the field "Enable Google Fonts" should be set to "ON". You can add additional fonts in the "Add Google Font" section. In the Font Name / Font Family you have to either insert the font name of the font or a font family. In the Font URL field you have to insert the URL of the font file. If you would like to use the Nobile font, click on the "Quick Use" button. Go to Story Options » General Settings » Main and select the "Child Theme Folder" option in the "Load translation files from" field. If you would like to use the WordPress installation in one language only, other than U.S. English and you are not using any additional language plugins, you can select your WordPress installation language in Settings » General » Site Language section of the WordPress admin dashboard. You can alternatively also set the language locale manually in the Story Options » General Settings » Main » Default locale field. You can check a list with more language locales here: http://codex.wordpress.org/WordPress_in_Your_Language. If you use additional language plugins, such as WPML you have to leave this field empty, as the plugin will be the one to configure the locale based on its options. If you would like to use the WordPress installation in multiple languages, the easiest way to accomplish this would be to use a multilingual plugin, such as WPML. Multilingual plugins add options to translate all the content into multiple languages and will also take care of setting the locale and loading the correct text translation. If for example, you have two additional languages, such as German and French, you just have to follow the instructions above and generate a .mo file for each language - that would be de_DE.mo and fr_FR.mo respectively. Story includes support for the e-commerce plugin WooCommerce. It registers a dedicated page template for the WooCommerce elements and applies custom styles to them. Once you install WooCommerce you can change some of the default WooCommerce settings, such as number of products per page and set the single product page layout in the Story Options » WooCommerce section. Additionally, for each page that the plugin generates (such as "Shop" page and "Cart" page), you can edit the corresponding page and apply the theme's settings to change the default layout, sidebars and header settings. As instructed in the "Product Image Sizes" section, please make sure to regenerate the thumnails of the existing products after changing the default settings. Slider - when this option is enabled, clicking on the thumbnail image will load a larger image in the main product image section. 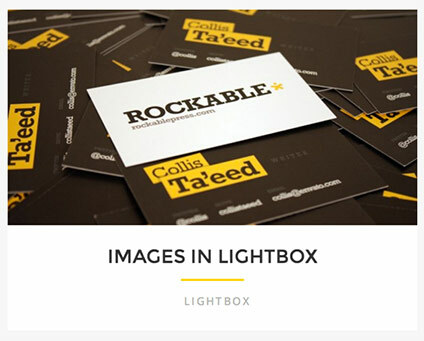 You can still preview the image in lightbox by clickinng on the maginfying icon. Story by default has the Slider option enabled. You can enable/disable these effects in the Story Options » WooCommerce » Product Gallery Effects section. Please keep in mind that the theme doesn't change the way WooCommerce works, it only applies custom styles and layouts to its content. If you have any questions related with the WooCommerce functionality, please make sure to check the WooCommerce documentation and support forums. All the plugins are bundled with the theme zip file by default. When you activate the theme a message saying that the theme recommends these plugins will be displayed in the top section of the admin pages. You can either install the plugins you need or dismiss the message by clicking on the "Dismiss this notice" link. If you decide to install any of the plugins later, you can access the recommended plugins page in the Appearance » Install Plugins section. Note: The Contact Form widget that you see on the demo in sidebar section is not added via plugin, but with a shortcode. It is explained how to add a contact form in the Sidebar Contact Form section above. We have also included a style.less file which is the one that we have used to generate the style.css file, so if you would like to apply major modifications to the style of the theme, you may consider using this file to generate the style.css where all the main colors and sizes are declared as variables. The style.less file is located in the root folder of the theme. You can check the full list with sections in the beginning of the file. Note: If you need to do some CSS changes, it is recommended to add the new styles into the Story Options » Styles Settings » Additional Styles section, rather than editing the style.css file itself, as these changes will be saved trough the updates of the theme. If you would like to apply some code tweaks, it is recommended to use a child theme so that the changes can remain saved after you install theme updates. If you would like to apply some CSS changes only, you can add the CSS snippets in the Story Options -> Typography & Styles -> Additional Styles section, however if you would like to apply some additional code tweaks, such as PHP code changes, it is recommended to use a child theme instead. After you install the theme you can add custom CSS snippets in the style.css file of the child theme, custom PHP code in the functions.php file, add the theme translation files in the lang folder of the child theme and create other files to overwrite the current templates - you can read more about using child themes in the official WordPress Child Themes guide. You can use the add_action() function to run custom code on any of these hooks. Note: If you have already explored all the sources of information stated above, and you are still experiencing problems with the theme set up, you can open a ticket with your question on the Pexeto Support Site. Important: The folder that contains the theme files must be called "thestory" in order to automatically update the theme. Due to the retirement of the old Envato API, since version 1.9.2 of the theme we have changed the way automatic updates are installed from the Dashboard. We had to remove the Envato Toolkit Library from the theme and recommend installing the Envato Market Plugin that can replace it. Added: An option to add a "scroll down" arrow to the first slide of the fullscreen slider. You can enable it in the "Story Options" » "Slider Settings" » Fullscreen Slider » "Show a scroll down arrow on the first slide" field. Added: an autoplay functionality to the fullscreen slider. It can be enabled per slider in the page settings section of the page that contains the slider. Added: an option to change the sticky header and header overlay background colors. Added: one-click demo import functionality in Story » Demo Import section - you can read more about it in the Installing and activating the theme section. Added: an option to disable the single hover effects from the portfolio items in the portfolio gallery and carousels. The option is located inthe Story Options » Post and Page settings » Portfolio Posts » "Enable hover effects in galleries and carousels". Added: A fullscreen video background option to the fullscreen slider. You can read more about it in the Fullscreen Slider section. 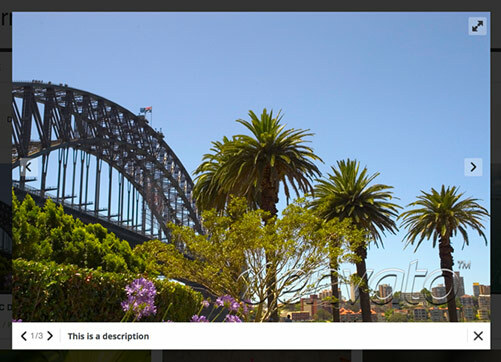 Added: Full-width layout option to the Quick Gallery in the full-width pages. You can read more about this option in the Quick Gallery section. 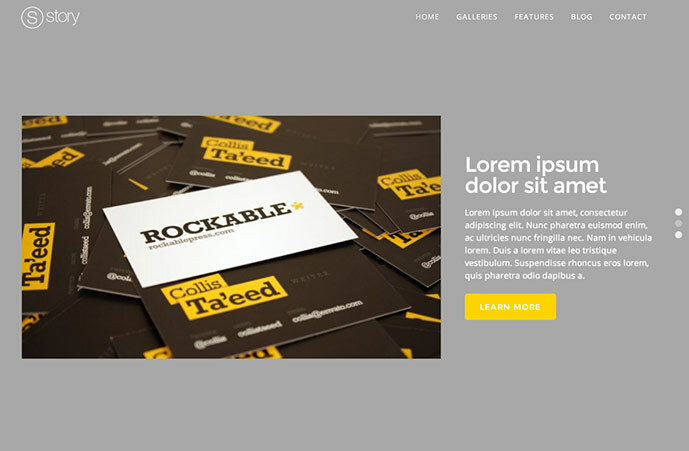 Added: A parallax effect option for the header title section. You can read more about this option in the Header Title section. Added: An autoplay functionality to the fullscreen slider's inner horizontal slider. You can read more in the Fullscreen Slider section. Added: An option to change the default copyright text in the footer's copyright section to a custom text. You can read more about this option in the Footer section. 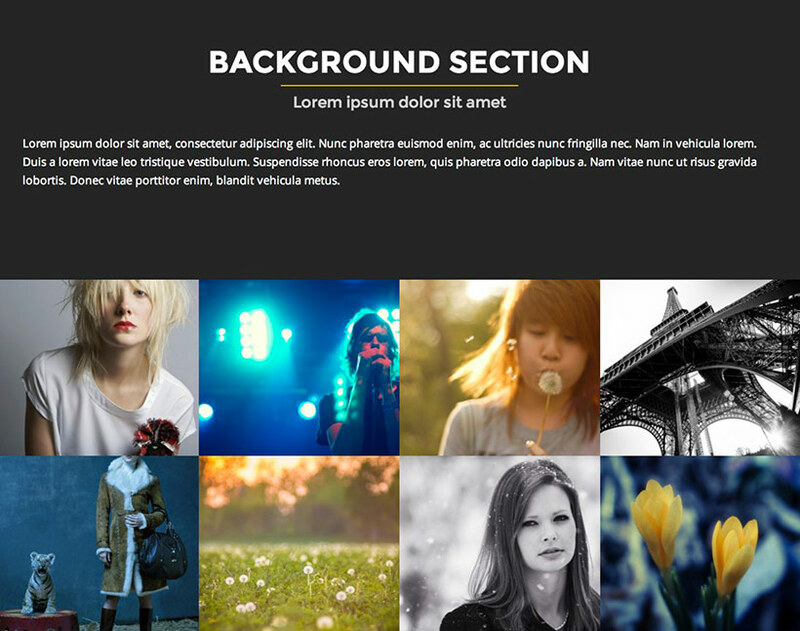 Added: An option to set a background image to the Boxed Layout of the theme. You can read more about this option in the Styles section. Added: A new demo (Vintage) to the Story » Demo Import section. Added: Option to add a custom slider shortcode in the header, so you can easily embed third party sliders (e.g. Revolution Slider). For more information, please refer to the Custom Header Sliders section. 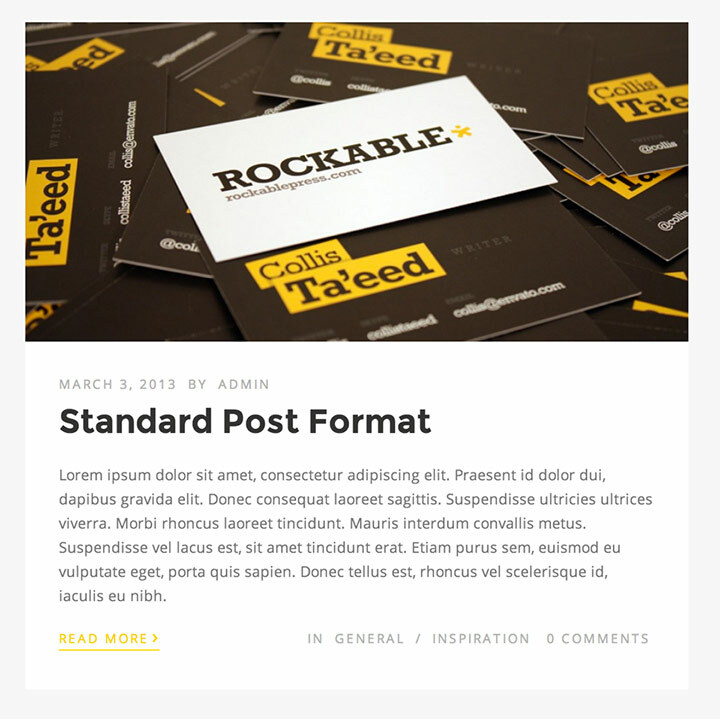 Added: Option to select the background style in the content slider. For more information, please refer to the Content Slider section. Added: LinkedIn button to the sharing buttons set - it can be enabled/disabled in the Story Options -> General Settings -> Social Sharing section. Added: Option to change the default vertical padding of the content slider. The option is located in the Story Options -> Slider Settings -> Content Slider section. Added: Option to hide the featured image from the single portfolio pages (when the item type is set as "Standard Page". 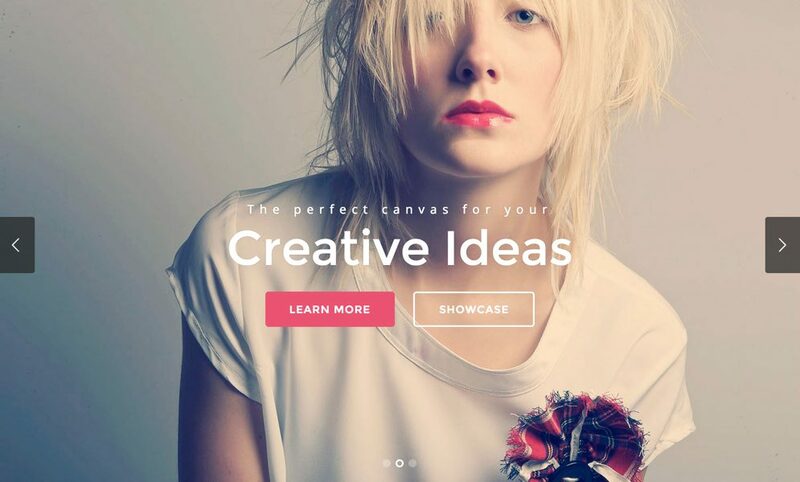 The option is located in the Story Options -> Post & Page Settings -> Portfolio Posts -> "Display featured image" section. Added: Option to change the default portfolio carousel thumbnail height. For more information, please refer to the Portfolio Carousel section. Improved: Visual Composer plugin compatibility. The theme registers all of its custom shortcode elements with the Visual Composer, so that you can now use the Visual Composer builder instead of the theme's elements builder if you prefer that. 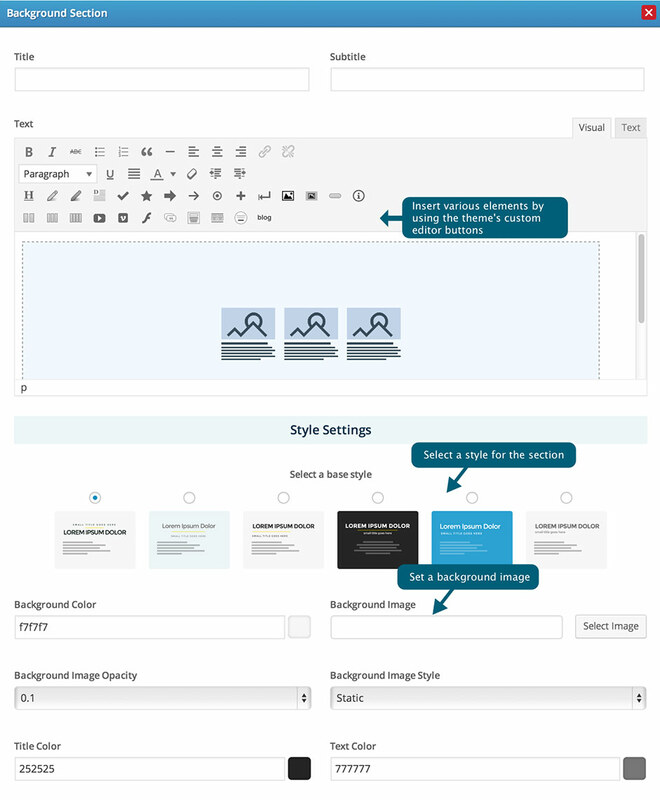 Please note that the Visual Composer plugin is not included with the theme. 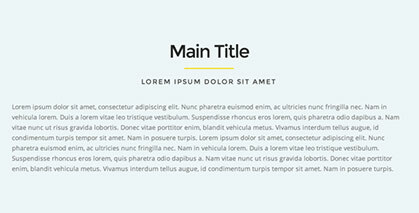 Added: A "Title & Image in header" blog post style that shows the title and featured image in the header of the single post page. You can read more about this option in the Post Styles section. Added: A related posts element to the single post pages. You can read more about how to configure it in the Showing the related posts section. Added: An option to display an album of images in the portfolio carousel when it is loaded in non-gallery pages. For more information please refer to the Portfolio Carousel section. Added: An option to set all the panes of the accordion element to be closed by default. For more information please refer to the Accordion section. Added: An option to the content slider to enable autoplay on mobile devices (which was always disabled by default). The option can be found in the Story Options » Sliders » Content Slider » "Autoplay on mobile devices" section. Added: option to add the content slider to the content of the pages/posts. For more information please refer to the Content slider in page/post content section. Added: WordPress hooks to the main elements (header, content and footer) so that custom code can be applied to those sections in child themes. For more information please refer to the Hooks section. Fully handle the WordPress 4.3 terms splitting. The upcoming WordPress 4.3 will automatically split all of the shared terms between different taxonomies, which means that it will change the IDs of those terms in the database. This can affect the theme’s elements that store references to the terms IDs. With this theme update, when a term splitting occurs, the theme will change all of the references from the old IDs to the new IDs. 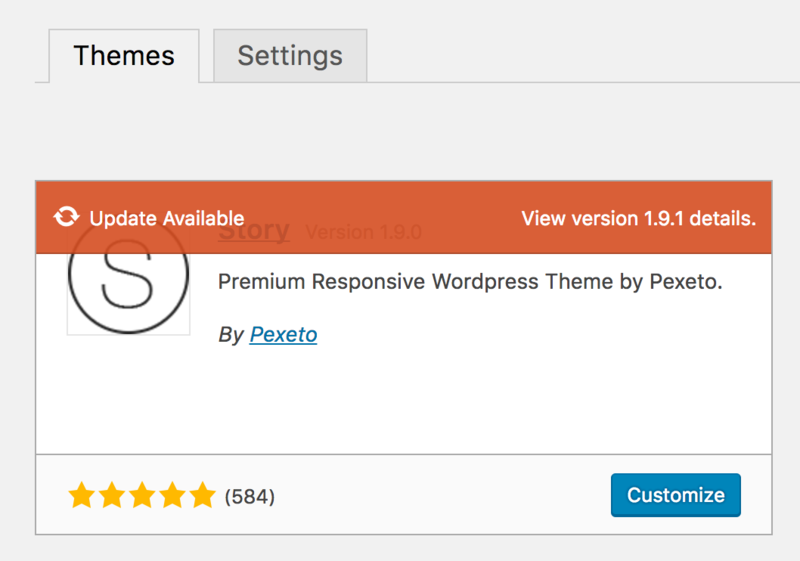 Important: Please make sure to update the theme before updating WordPress to 4.3 once it is released, as the terms splitting will be performed during the WordPress upgrade process. 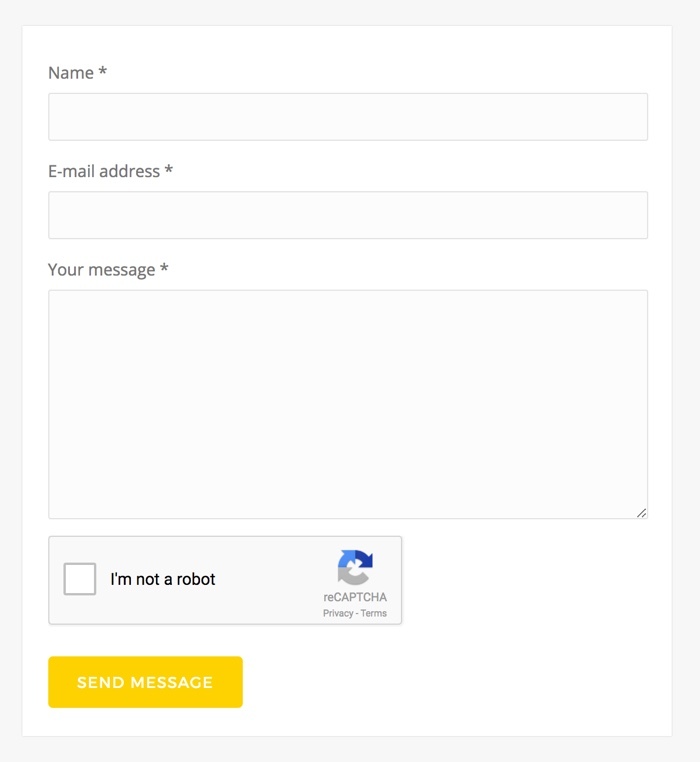 Updated the contact form reCAPTCHA widget to version 2, since version 1 is now deprecated and will be shut down in March 2018. This requires generating new API keys. Please refer to the Contact Form Page section for more details. GDPR: Add support for the upcoming WordPress 4.9.6 comment form cookie checkbox. The commenter cookie is used to pre-fill the name, email and URL fields of the comment form when the commenter intends to post another comment. It also allows the commenter to preview and delete any comments awaiting moderation. WordPress 4.9.6 automatically includes the cookie checkbox in the comments form, however you need to update the theme to version 1.9.6 in order for the checkbox to be displayed. WordPress 5.0 Preparation: Make the Classic Editor plugin required by default. This theme supports the classic editor only and a major part of its elements rely on the classic editor. If you wish to use Gutenberg, you can do so by not installing the Classic editor plugin, however please keep in mind that some of the theme elements might not function properly, as they were designed to be added via the Classic Editor. You can learn more in this article.